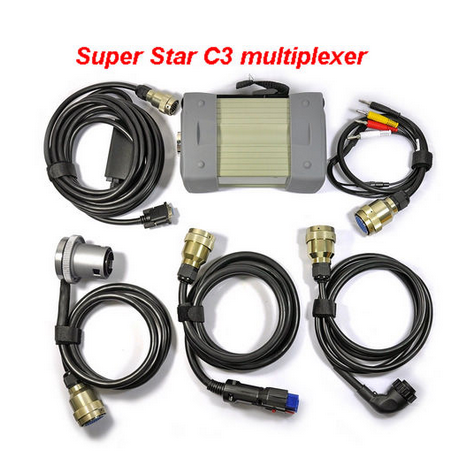 Mb Star C3 Mercedes Star Diagnostic Tool work for Benz car & trucks till 2014.12. Compare SD C4 SDConnect Multiplexer, the client prefers to use Benz Star C3 work for old models. Below obd2tool.com share client Mercedes Star Diagnostic Tool Benz Star C3 experience as follow. I am going to keep posting my updates about doing an AAM and SRS module swap in my 01 ML 430 Sport using the Chinese clone Benz star c3 diagnosis tool. I received my MB Star C3 from Obd2tool.com yesterday and the Dell D620 a day earlier to use for the Benz Star C3. Replacing the hard disk with the one supplied with the Benz Star C3 Multiplexer was a snap. After watching a few videos on YouTube on how to set up the Xentry and Das programs I had them up and running. But then it took me another 3-4 hour of playing and researching online to figure out how to set up the RS232 port to see the Stardiagnos. At 10:30 last night, and very exhausted it came to life. As I had figured the AAM and SRS modules were completely non-responsive and could not be talked with via the tool. This morning I ordered a new AAM and with free shipping and $370 it is on its way to my shop. I picked up a SRS module from a wrecked ML in a local junk yard that I hope will work. I plan on attacking the SRS system this weekend and the AAM next week. I have been working through the Xentry emulator to learn how to properly set up and program these parts today at my desk and think I have it down pretty well. It is pretty simple once you figure out the navigation and menu structure in the DAS system. So stay tuned and offer a prayer for me that I do not brick any of the components in my truck. Client need any Mercedes Star Diagnostic just contact us freely.